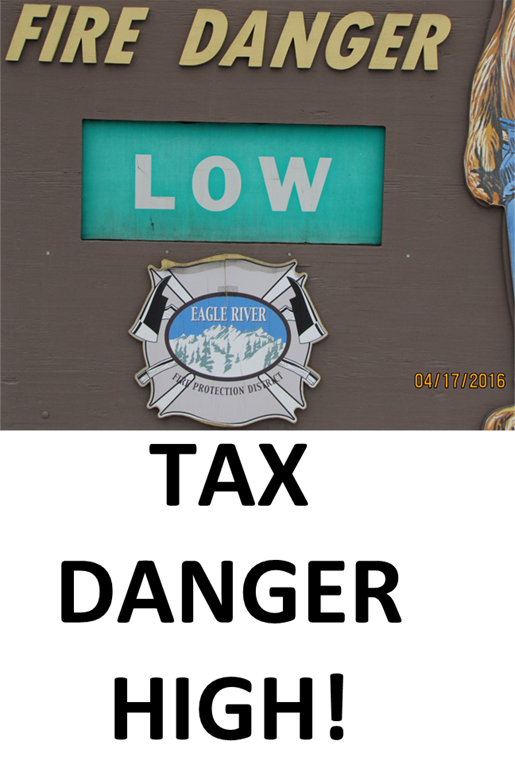 Fire Danger Low – Tax Danger HIGH! Here is some local Tax Advise from the folks at the ECT! 1 – Make sure that your Personal and Business Tax returns are completed and U.S. Mailed on or before April 18th 2016. 2- Your Property Tax payments are current – and note if your Assessed Property Value has gone up – you’re already paying these Taxing District(s) more money – because they have NOT lowered your 2015 Mill Levy. Of course NONE of the pro-Tax information that is circulating…mentions this Tax Fact. 3 – Make sure your credit card payments are 100% current and you’re not paying any interest expenses. How much did your Family’s Health Insurance cost go up this year? 4- Is more Affordable Housing important you? If Yes, then ask “how does Voting to Raise Taxes – make our Housing “More Affordable”? 5 – Do you have kids in Eagle County’s Public Schools? Our School District has announced their intention to ask for another Tax Increase (November 2016). After Voting for all these Tax Increases in May 2016 – will you have enough family income to Vote for even more this November? 6 – Consider the FACT that our Ambulance District (Vail Pass to Dotsero) will continue their existing policy of “charging their customers” for a ride to the Hospital – even though they might get their Tax Mill Levy increase approved by local voters. Fred Morrison (Amby District CEO) can be reach at the Ambulance District W 970.926.5270 if you’re like to speak to Fred about his Policy. 7 – Scroll Down into the ECT and read “just who” is supporting all these proposed new Tax Increases. Q.) Do these folks have your family’s interest in mind – or just their own Financial Gain – to be considered. Yes, all these considerations are important because if your don’t consider them – you may (inadvertently?) Vote your family – A LOWER STANDARD OF LIVING – if your family’s income is not increasing at a rate fast enough to keep pace with all these proposed new TAXES!